Roger A. Welchans completed his BFA at the Chicago Art Institute of the University of Illinois and his MFA at the University of Colorado. During this time he participated in roughly 80 national exhibitions and a regional juried exhibition, winning many awards, and was featured in private and institutional collections. 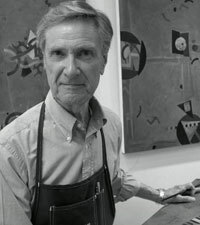 He took a recess from painting from 1962-96 while earning a PhD in Art History from Case Western Reserve University. Welchans has held a number of prestigious positions with such notable institutions as the Cleveland Museum of Art, John Carroll University, JCU Fine Arts Gallery, Akron Art Museum, Cleveland Artists Foundation and the Artists Archives of the Western Reserve. Additionally, Roger has served as a juror for many national and regional exhibitions and conducted numerous lectures, gallery talks and courses. He is also a published author, having written articles, essays, and books on a variety of art related topics. Roger’s current approach to painting, while similar to Modernist geometric abstraction, is intentionally different. His geometry is “impure” and highly animated, to the point of intentionally suggesting a visual narrative, very often inspired by his love of opera. Roger believes that the surfaces of his work reflect the artist’s “touch”; they are carefully crafted and very tactile, with brushwork, collage devices, and even partial handprints.